Like Freud's Last Session, which I saw just a few days earlier, Gidion's Knot is another one of those "two people sitting in a room talking" plays. Or in this case, two people sitting/pacing/writhing/crouching in a room talking/arguing/crying/comforting/accusing. Playing out in real time, two women - a mother and her son's teacher - get into some pretty serious issues involving their son/student Gidion. It's intense, gripping, and at times painful to watch. With real and raw performances by Aditi Kapil and Laura Esping, well directed by Noël Raymond, it's extremely compelling theater. Corryn's (Aditi Kapil) son Gidion was suspended by his 5th grade teacher, so she makes an appointment to meet with Ms. Clark (Laura Esping). But because of events that occurred in the few days since the suspension, Ms. Clark doesn't expect her to show up. We soon learn that Gidion has died, and Corryn wants to talk to his teacher to learn about his last days and the events that lead to his suspension. She's not ready to let him go and seems to find comfort in hearing about his friends and his school work. They dance around the issue, as Ms. Clark tries to put off talking about the suspension, leaving Corryn and the audience to imagine the worst. When the true story finally comes out, it's devastating. Both women have regrets, and disagree about a number of issues that come up, including freedom of speech, child abuse, and bullying. There are no easy answers and no resolution, but somehow it seems that both women are in a better place after the encounter, as painful as it is to live through. This is another beautifully done production by Pillsbury House Theatre. First - the cast. Aditi is just heart-breaking as this fierce, strong, angry, grieving mother, and Laura takes her character from the somewhat reserved schoolteacher trying to keep things calm to really laying it all out on the line, and exposing a vulnerability of her own. The set by Joseph Stanley is an exact replica of an elementary school classroom. Bright colors, desks filled with books and notebooks, papers and projects hung on the wall, a computer corner. There's even a functional clock onstage where you can see the minutes ticking away, except that you're so captivated by what's happening that you might not even notice. This is a rather short blog post, but I don't want to give away too many details of the plot. All you need to know is that it's an intense 90 minutes of theater dealing with issues that face kids and parents and teachers today, well-written and brilliantly acted. 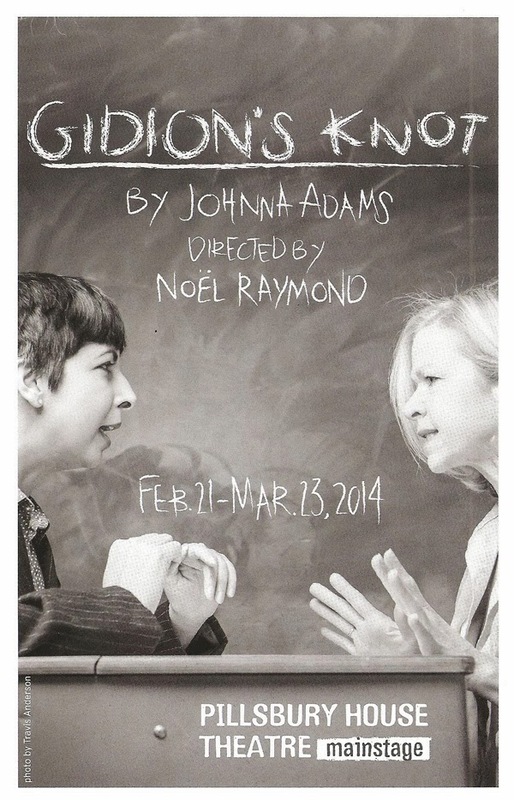 And it's playing now through March 23 at Pillsbury House Theatre, with all tickets "pay what you can," from $5 to $50.